Video Campaign Aims To Unify Poland Through The Power Of Bread : The Salt Hate crimes are on the rise in Poland. In response, a new YouTube video aspires to foster tolerance by having people from marginalized groups bake and sell bread to customers at a Warsaw bakery. Hate crimes are on the rise in Poland. In response, a new YouTube video aspires to foster tolerance by having people from marginalized groups bake and sell bread to customers at a Warsaw bakery. Above, some of the loaves baked and handed out as part of the campaign. 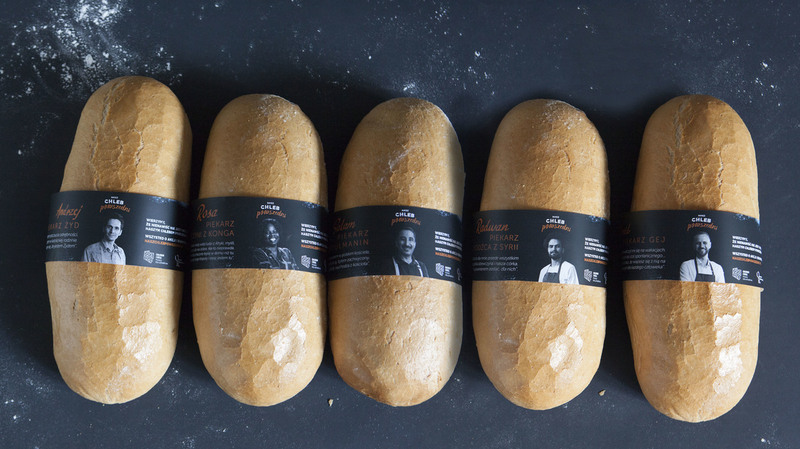 Each loaf is wrapped in a black ribbon with a photo and information about the person who baked it. Salti is participating in a new Polish campaign called Nasz Chleb Powszedni, or "Our Daily Bread," which aims to inspire tolerance and understanding in Poland by having people from five marginalized groups — gays, Jews, Muslims, refugees and black people — bake and sell bread to customers at the Putka Bakery in Warsaw. The experience is encapsulated in a three-minute video released on YouTube. The next part of the campaign includes selling bread baked by minorities in various cities around the country. The campaign is headed by two women, Anna Bińczyk and Magdalena Korzyńska. "We were looking for something that would connect people instead of dividing them," says Bińczyk. The video jumps between shots of the participants preparing, kneading and dusting bread among snippets from events in Poland containing nationalist, anti-Semitic, homophobic and anti-Muslim messages. Although Polish Defense Minister Mariusz Błaszczak claims that xenophobia is a rare occurrence, the numbers tell a different story. The Stefan Batory Foundation, a non-governmental organization that supports democracy in Poland, issued a report that analyzed the use and consequences of hate speech among Polish adults and young people (16-18 years old) first in 2014, and again in 2016, times surrounding the parliamentary elections of 2015. It found that incidents of hate speech aimed at minority groups (refugees, immigrants, Muslims, the LGBT+ community, Jews, Roma, and people of color) increased during that period, and that more Polish people were exposed to hate speech in public spaces, the media and online. The report said that repeated exposure to hate speech was associated with a higher tolerance for it. The National Public Prosecutor's Office reports that the number of cases against racist, xenophobic or homophobic crimes has been rising steadily since 2012, when there were 473 cases reported. In the first part of 2017 alone, that number was 947. "Hate speech and violence motivated by prejudice are not rare in Poland. They are poisoning the public sphere. The amount of hate based on someone's ethnic origins, race, nationality or sexual orientation is huge in Poland," says Damian Wutke, secretary of the Association Against Racism and Xenophobia, one of the two organizations involved in making the video. The other is Chlebem i Solą (With Bread and Salt), which is devoted to helping refugees. Salti has been living in Warsaw since 1991, and he says he feels both Syrian and Polish. He is now a well-respected gynecologist, but claims that he still occasionally hears racial slurs, such as "dirty Arab." He says he replies to them with humor: "Thank you for letting me know. I'm now going home to take a shower." To counteract these trends, Bińczyk and Korzyńska decided to dig deep into the symbolic importance of food, and most specifically, bread. "In Poland, bread has a place on every table, regardless of our opinions and prejudices," Bińczyk explains. "Shared meals are moments that should bring people together — and bread is a symbol that is almost sacred. We share it. We pray for it. No one should lack for bread and you should never throw it away," says Wutke. Traditionally, if a piece of bread falls on the floor, it is picked up, blessed with the sign of the cross and sometimes even kissed. Like many Polish intellectuals, writers and artists of the late 19th century, Norwid himself spent a lot of time living abroad, including New York, Berlin, London and finally Paris where he died. This was motivated both by his desire to study painting in Germany and Italy, and the fact that at that time, Poland was divided between Russia, Prussia, and Austria, and didn't exist as an independent country. Many intellectuals were forced into exile. Throughout history, Poles also moved abroad in search of better opportunities, especially after Poland joined the European Union in 2004 and getting a job in Western Europe became easier. This type of emigration is called za chlebem, or "after the bread." But can food — and especially bread — help foster tolerance and understanding? Salti believes so. "Food is not just food. It's one of life's basic pleasures. Not everyone likes drinking alcohol or smoking marijuana, but a common meal can bring people together. You can eat my food. I can eat your food. And the gap between us has decreased," he says. Although the makers of Nasz Chleb Powszedni had problems convincing bakeries to participate (many owners were worried about how business would be affected by such a campaign), the video was hugely popular in Poland, and gained the attention of several major media outlets, including Gazeta Wyborcza, the country's most prominent newspaper. The video attracted more than one million views on the first day. "It was so popular because it left the viewer with a feeling of reassurance, it's very positive. And that's what we're missing in Poland the most," says Bińczyk. And despite some rather frightening events in Poland — a 14-year old Turkish girl was violently beaten in Warsaw in January — there is some hope that "hate will never become our daily bread. I believe that Poland can be a country where everyone feels safe," says Wutke. When Salti asks his customers whether they could detect a difference in the taste of the bread now that they knew who made it, one woman says, "No." Another man adds, "It's normal." And a third person says: "There is no difference. A human being is a human being, always." Olga Mecking is a writer, journalist, and translator based in the Netherlands.